17 December 2010: The Space Telescope European Coordinating Facility, a unique collaboration between the European Space Agency (ESA) and the European Southern Observatory, will close on 31 December 2010 after 26 years. ESA’s continuing partnership with NASA on the Hubble mission ensures that European astronomers will continue to have access to observing time. 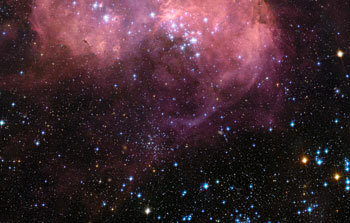 14 December 2010: Hubble has spotted a festive bauble of gas in our neighbouring galaxy, the Large Magellanic Cloud. Formed in the aftermath of a supernova explosion that took place four centuries ago, this sphere of gas has been snapped in a series of observations made between 2006 and 2010. 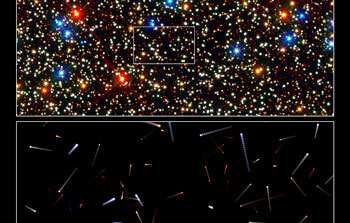 26 October 2010: Astronomers are used to looking millions of years into the past. 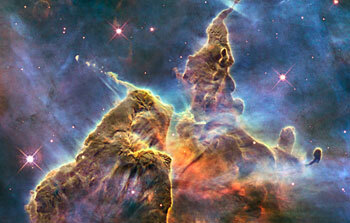 Now scientists have used the NASA/ESA Hubble Space Telescope to look thousands of years into the future. Looking at the heart of Omega Centauri, a globular cluster in the Milky Way, they have calculated how the stars there will move over the next 10 000 years. 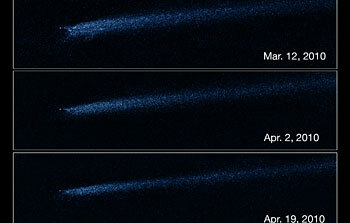 13 October 2010: An international team of astronomers has observed what happens after asteroids crash together. 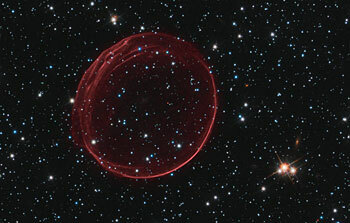 Using Hubble to study the aftermath of one such collision over five months, they watched a strange, comet-like debris trail slowly evolve as the collision site orbited the Sun. This research gives clues about how asteroids behave when they collide, and how the fall-out from these impacts contributes to the dust that pervades the Solar System. 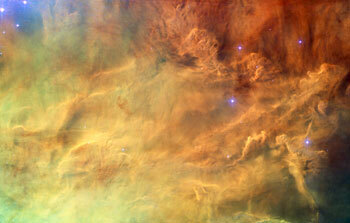 22 September 2010: A spectacular new NASA/ESA Hubble Space Telescope image reveals the heart of the Lagoon Nebula. Seen as a massive cloud of glowing dust and gas, bombarded by the energetic radiation of new stars, this placid name hides a dramatic reality. 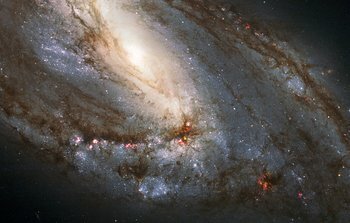 19 August 2010: An international team of astronomers using gravitational lensing observations from the NASA/ESA Hubble Space Telescope has taken an important step forward in the quest to solve the riddle of dark energy, a phenomenon which mysteriously appears to power the Universe's accelerating expansion. Their results appear in the 20 August 2010 issue of the journal Science. 12 August 2010: 12-Aug 2010 Curling around itself like a question mark, the unusual looking galaxy NGC 4696 itself begs many questions. Why is it such a strange shape? What are the odd, capillary-like filaments that stretch out of it? And what is the role of a large black hole in explaining its decidedly odd appearance? 13 July 2010: A colourful star-forming region is featured in this stunning new NASA/ESA Hubble Space Telescope image of NGC 2467. Looking like a roiling cauldron of some exotic cosmic brew, huge clouds of gas and dust are sprinkled with bright blue hot young stars. 22 June 2010: A spectacular new NASA/ESA Hubble Space Telescope image — one of the largest ever released of a star-forming region — highlights N11, part of a complex network of gas clouds and star clusters within our neighbouring galaxy, the Large Magellanic Cloud. 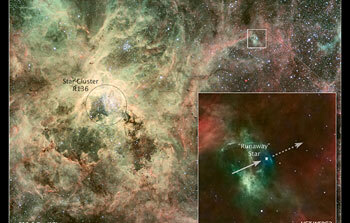 This region of energetic star formation is one of the most active in the nearby Universe. 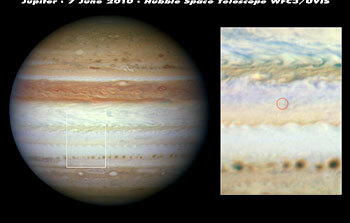 16 June 2010: New and detailed observations from the NASA/ESA Hubble Space Telescope have provided insights into two recent events on Jupiter: the mysterious flash of light seen on 3 June and the recent disappearance of the planet’s dark Southern Equatorial Belt. 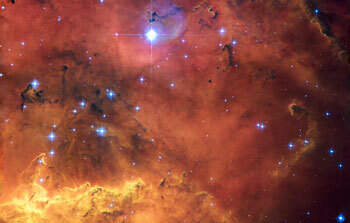 31 May 2010: By exploiting the exquisite image quality of the NASA/ESA Hubble Space Telescope and comparing two observations made ten years apart astronomers have, for the first time, managed to measure the tiny motions of several hundred young stars within the central cluster of the star-forming region NGC 3603. The team was surprised to find that the stars are moving in ways that are at odds with the current understanding of how such clusters evolve. 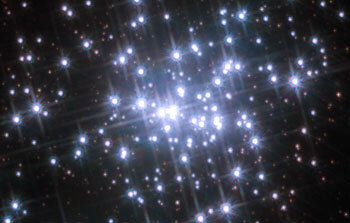 The stars in the cluster have not “settled down” as expected. 11 May 2010: A heavy runaway star rushing away from a nearby stellar nursery at more than 400 000 kilometres per hour, a speed that would get you to the Moon and back in two hours. The runaway is the most extreme case of a very massive star that has been kicked out of its home by a group of even heftier siblings. Tantalising clues from three observatories, including the NASA/ESA Hubble Space Telescope’s newly installed Cosmic Origins Spectrograph (COS), and some old-fashioned detective work, suggest that the star may have travelled about 375 light-years from its suspected home, a giant star cluster called R136. 23 April 2010: The best recognised, longest-lived and most prolific space observatory zooms past a milestone of 20 years of operation. On 24 April 1990, the Space Shuttle and crew of STS-31 were launched to deploy the NASA/ESA Hubble Space Telescope into a low-Earth orbit. What followed was one of the most remarkable sagas of the space age. 8 April 2010: Hubble has snapped a spectacular view of the largest "player" in the Leo Triplet, a galaxy with an unusual anatomy: it displays asymmetric spiral arms and an apparently displaced core. The peculiar anatomy is most likely caused by the gravitational pull of the other two members of the trio. 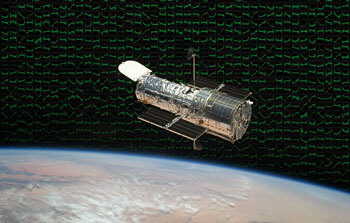 25 March 2010: A new study led by European scientists presents the most comprehensive analysis of data from the most ambitious survey ever undertaken by the NASA/ESA Hubble Space Telescope. These researchers have, for the first time ever, used Hubble data to probe the effects of the natural gravitational "weak lenses" in space and characterise the expansion of the Universe. 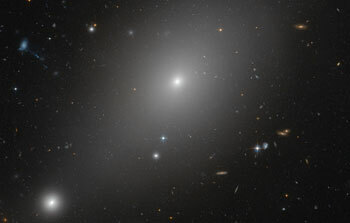 4 March 2010: In general, galaxies can be thought of as "social" — hanging out in groups and frequently interacting. 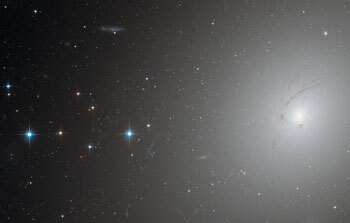 However, this recent NASA/ESA Hubble Space Telescope image highlights how some galaxies appear to be hungry loners. 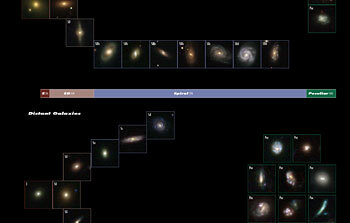 These cosmic oddities have set astronomers on the "case of the missing neighbour galaxies". 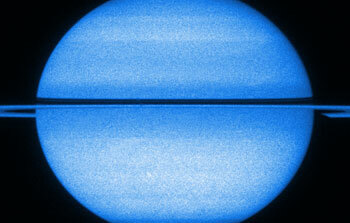 11 February 2010: Researchers using the NASA/ESA Hubble Space Telescope recently took advantage of a rare opportunity to record Saturn when its rings are edge-on, resulting in a unique movie featuring both of the giant planet's poles. Saturn is only in this position every 15 years and this favourable orientation has allowed a sustained study of Saturn’s almost symmetric northern and southern lights. 4 February 2010: Using data from the NASA/ESA Hubble Space Telescope, astronomers have, for the first time, created a demographic census of galaxy types and shapes from a time before the Earth and the Sun existed, to the present day. The results show that, contrary to contemporary thought, more than half of the present-day spiral galaxies had so-called peculiar shapes only 6 billion years ago, which, if confirmed, highlights the importance of collisions and mergers in the recent past of many galaxies. 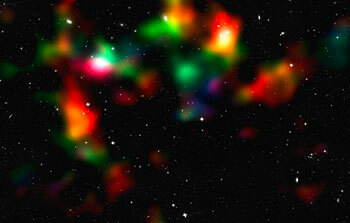 It also provides clues for the unique status of our own galaxy, the Milky Way. 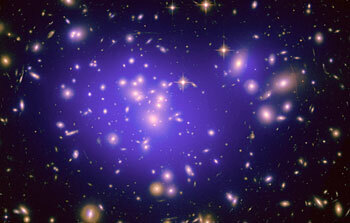 5 January 2010: The NASA/ESA Hubble Space Telescope has broken the distance limit for galaxies and uncovered a primordial population of compact and ultra-blue galaxies that have never been seen before. 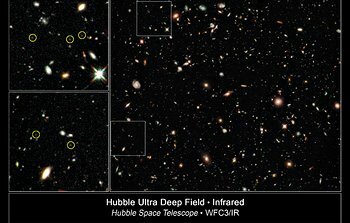 The data from the Hubble’s new infrared camera, the Wide Field Camera 3 (WFC3), on the Ultra Deep Field (taken in August 2009) have been analysed by five international teams of astronomers. Some of these early results are being presented by various team members on 6 January 2010, at the 215th meeting of the American Astronomical Society in Washington DC, USA.